A graph is shown with the y axis labeled "Ping Time, ms" and the x axis labeled "Clock time". An airplane, bearing the annotation "Boeing 777", is shown flying. Below it are shown two dials in a close-up view, each having a large indicating needle pointing at a slightly different angle. The first dial is labeled "kmph" and the second is labeled "knots". The internals of a computer disk drive are shown, including a circular platter with a circular hub, and an actuator arm. A counterclockwise circular arrow is shown near the edge of the platter. An annotation near this arrow reads: "Rotational Latency". A radial line with an arrowhead at each end extends from near the hub to near the edge of the platter. An annotation near this double-headed arrow reads: "Seek Time". A fire hydrant is shown. 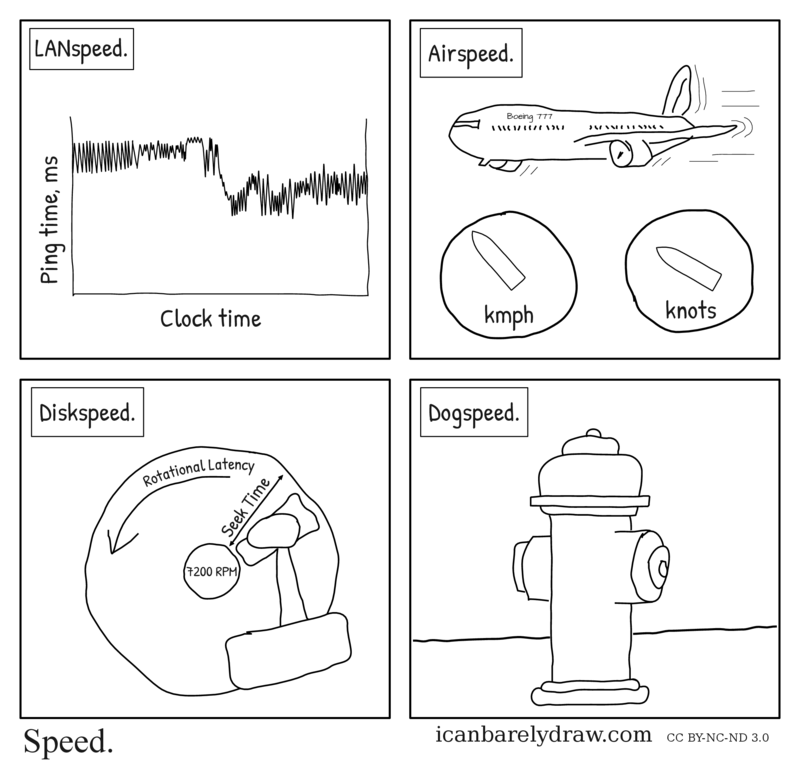 But if I had to guess: It’s a typical 3 normal pics setting the tone and then a supposed funny as the punchline. So these are all important speed related things in the author’s life. Electricity, people and data have to move in time. And then there’s the waterpost which measures the speed of a dog because they stop by each one? Numerous reasons why that doesn’t make much sense but that’s the best I’ve got.